Lured by stories of schooling hammerhead sharks and a lost city submerged below the surface, Farhat Jah headed out on the long journey to Japan’s westernmost island. The sun rose on a small outcrop of rock in the Pacific Ocean. The sea was calm, but a steady roll of small waves slid up to the coast and then petered out on a seemingly invisible reef. The sun was warm but muted at this hour. A fishing boat motored slowly out of the tiny harbour and headed for the horizon. I looked out over the balcony and saw a cow chewing on grass in the garden. It was January and at 7:45 in the morning, the sun had just risen on Yonaguni Jima—Japan’s forgotten isle. 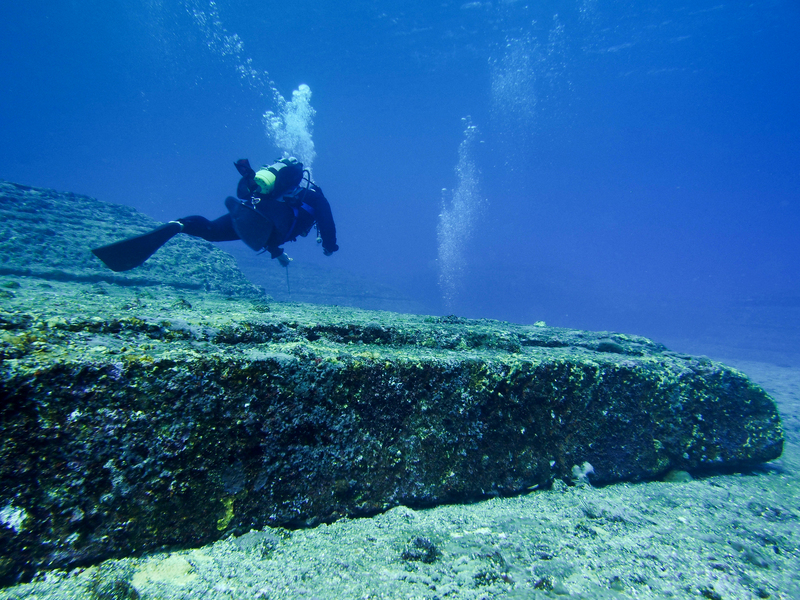 Yonaguni rose up out of the ocean floor. This was no coral atoll, it was a solid rock. One small town, two very small villages and two sheltered harbours made up the human addition to the island. It was cold, 16°C, and a gentle wind blew at all times over the rocks. The atmosphere was quite bucolic. We were 60 miles from Taiwan, 1,800 miles from Tokyo and yet, due to the similarity in vegetation, I felt as though I was in Micronesia. Sugar cane and tropical scrub covered most of the land, while fields and the airstrip took up what remained. Rocky cliffs dominated the coast, punctuated by the most idyllic, white, sandy beaches with clearly visible coral bommies sitting in the shallow water. Best of al, not a person was to be seen anywhere. We arrived in an old and greasy Canadian-made DASH 8 turboprop. After a low flight over water, the aircraft circled the island before lining up on the new runway. Passengers were treated to a view of the waves crashing relentlessly on the black cliffs. Winds gusting over the rock, made for an interesting landing. We had come here to look for schooling hammerhead sharks and to see the ruins at Iseki Point. The whole expedition rested upon two people: Douglas Bennett, a 42-year-old ex-U.S. Marine who runs Reef Encounters 300 miles away on Okinawa; and Kihatchiro Aratake, the 65-year-old owner of Sou Wes Dive Centre and director of the Yonaguni Tourism Association. We loaded up a rusty Toyota minibus and trundle along the road to one of the two tiny harbours. The dive master carried some of the kit down. Rather than watch him, we pitched in and carried extra tanks, BDC’s and general bits. I was getting the impression that the Japanese way of doing dive things is a little different to the western world. I needed to borrow a BCD and was given an old Sea Quest that had not been made for 15 years and was a size or two too small. Regardless, it went on, and I could just get the clips done up—perfect. I smiled to myself at the thought of what some less flexible diver might have thought.